A SCOTS mother spent her 40th birthday fighting for her life in intensive care after contracting sepsis and becoming “the most ill person in the UK”. Ruth Quilietti-Bird was rushed to hospital in March after suffering breathing problems, vomiting and diarrhoea. The mother-of-two was diagnosed with sepsis and had both legs amputated after spending over a fortnight in a coma. The cause of the near-fatal illness remains a mystery. Now friends of Ruth, from Musselburgh, East Lothian, are trying to raise £20,000 to fund a mobility scooter and adapt a new property. Ruth spent two weeks in a coma. Speaking today to his local newspaper, Ruth’s husband Mark, 47, said: “Her health deteriorated more and more and she was taken to the high dependency unit. “They said they needed to ventilate Ruth and that was the last time I spoke to her for two and a half weeks. She went into a medicalised coma. “The consultant told me to prepare myself because we were losing Ruth. They managed to stabilise her but her vital organs were failing. Her respiratory had already failed and her kidneys had failed. Ruth was later transferred from Edinburgh Royal Infirmary to a specialist unit at Aberdeen Royal Infirmary where doctors told Mark again to prepare for the worst. He said: “Her liver was failing and her heart was beginning to fail. They said again that they were losing Ruth and she wouldn’t last the inpatient stay. “They made the decision to fit a second extracorporeal membrane oxygenation (EMCO) circuit to support her heart and stabilise her. Then things started improving and they were able to withdraw some of the support and her blood tests were showing very small improvements. He added: “Ruth’s immune system was already affected, so it was abe to take over quickly, causing failure to the vital organs. She was diagnosed with sepsis and pneumonia. Ruth was infected with group A streptococcal – an aggressive bacteria which is around all the time. Mark said it was unknown what exactly caused the sepsis. Ruth’s friend Jacqueline Campbell said: “Ruth’s fighting spirit saw her through a horrific journey of near death experiences and of moving hospitals seven times to receive specialist treatment for her respiratory, heart and renal failures. “Mark was trying to juggle being with Ruth and maintaining some form of normality for their young children. 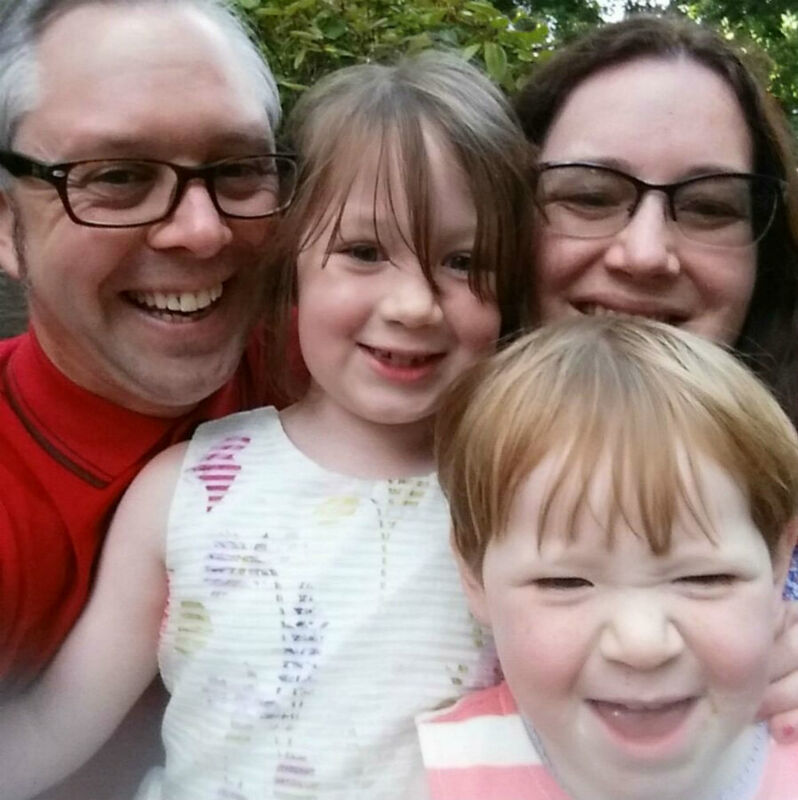 Her 40th birthday was spent in Intensive Care rather than on a planned family break. “Mark was told he should say goodbye, Ruth had a do not resuscitate notice added to her health records. Ruth fought back. “When Ruth finally woke up from her coma, after ten long weeks, her hands and feet were black and dying. “Ruth, an artist, still has her hands but both legs have been amputated below the knees. “Ruth’s family had more time to process this heartbreaking situation, but Ruth had little time to come to terms with the news. Ruth’s husband, Mark, was told to say goodbye. Ruth, who taught art at Knox Academy in Haddington, East Lothian, was moved hospitals several times to receive specialist care for organ failure. Her milestone birthday, on the 31st of March, was spent in intensive care instead of on holiday with her family. She is currently recovering at the Astley Ainslie Hospital in Edinburgh where two weeks ago she was given her new prosthetic legs. Ruth has also been having physiotherapy at the hospital and has even had her two daughters Lucia, 7, and Isabella, 5, involved. 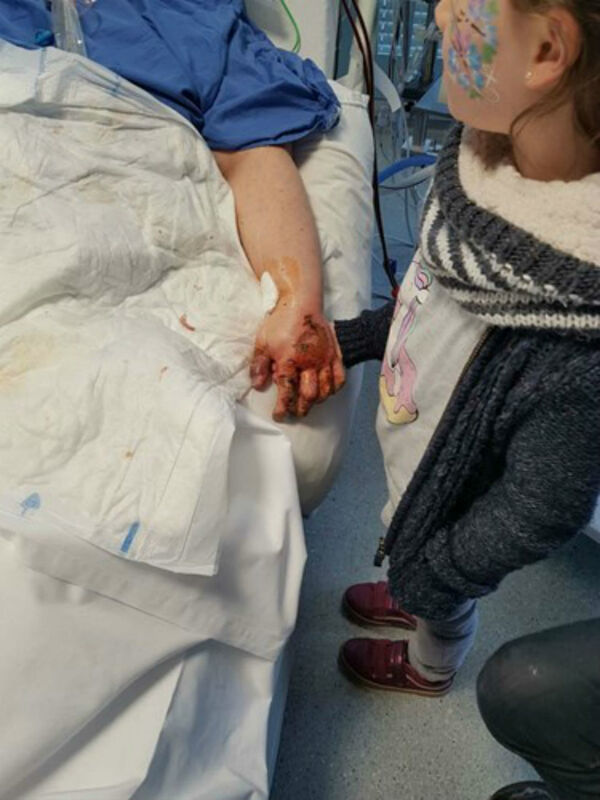 She has been in hospital for the past 14 weeks but fears she could also lose her hands.